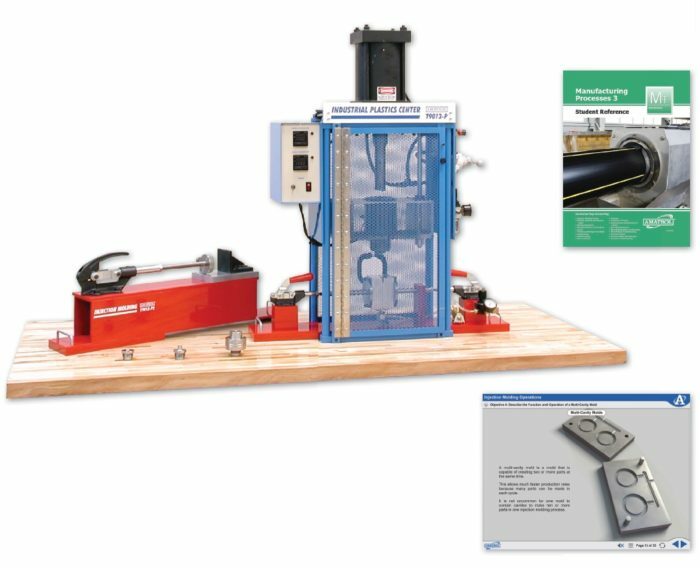 Amatrol’s Plastics Technology Learning System (94-MP-3T) is an all-in-one trainer that can perform injection molding, blow molding, and extrusion molding! With the ability to hold four ounces of plastics, the 94-MP-3T can perform multiple molding shots without learners needing to refill the system and wait for the plastic to melt. Additionally, this system features two digitally-controlled heater jackets located on the system’s barrel and nozzle to create dual temperature zones, which is a standard feature on industrial plastics machines. Plastics are used in nearly every industrial area from automotive to food and beverage. Besides strong hand-on learning, the 94-MP-3T features thorough theoretical knowledge that not only intricately explains the processes, operation, safety, and troubleshooting of the three major types of molding, but also offers curriculum in basic chemistry and then provides an in-depth look at polymers and the properties of plastics. The curriculum also covers safety data sheets (SDS) and plastics system purging. Tabletop Plastics Machine Delivers Real Results! Amatrol’s industrial plastics center uses a large, double-acting pneumatic cylinder, with an available force output of 2000 pounds, to force molten plastics into molds or through an extrusion die depending on the process. Digitally-controlled dual heater jackets on the barrel and nozzle provide precise heading control for each of the two plastics used in the training (high density polyethylene/polypropylene). The plastics center also includes strong safety features such as an interlock on the system’s door that prevents the cylinder from moving when the door is open and a removable key that controls the electrical power to the system’s heaters. The 94-MP-3T’s industrial plastics center can hold four ounces of plastics so learners can inject the molds several times consecutively instead of waiting for the plastics pellets to melt after each shot! This feature mimics a real-world injection molding workflow and allows learners to use their class time more efficiently. The larger capacity also means that the runners and sprues on multi-cavity molds are the current size and not undersized due to lack of plastics material. Custom Molds Teach Integral Hinge, Metal Inserts, and More! This learning system features three aluminum molds that allow learners to gain experience with a basic one-piece keychain mold that has raised letters, a mold that has an integral hinge, a more complex screwdriver mold that has a metal insert, and a multi-cavity box. Because aluminum is a heat sink, the parts cool and solidify quickly thereby reducing the delay between molding shots. This system includes a manual clamp that can apply up to eight tons of pressure to keep the molds closed during the injection process. The 94-MP-3T’s curriculum provides the theoretical backbone to compliment the strong hands-on skills by covering major plastics topics like injection and blow molding operations, platics chemistry and properties, and extrusion operations. The 94-MP-3T’s curriculum begins with the basics: molding material and machine safety; molding problems and solutions; inserts, threads and multiple part molds; integral hinge; and system purging. The curriculum then moves on to include: basic chemistry; polymers; manufacturing characteristics of plastics; blow molding processes, safety, and troubleshooting; and extrusion processes, safety, and troubleshooting. This curriculum is presented in a stunning multimedia version that utilizes text, audio, interactions, and 3D animations to fully engage learners. The 96-PLS1T Plastics Technology 1 Learning System advances learners’ plastics molding experience by allowing them to design and if they have a CNC machine, create their own molds. After covering topics such as sprues, runner systems, mold gates, shrinkage, and warpage, learners will then design an injection mold using CAD/CAM software and then create an injection mold using a CNC machine. A sample copy of the Manufacturing Processes 3 Student Reference Guide is also included with the system for your evaluation. Sourced from the system’s multimedia curriculum, the Student Reference Guide takes the entire series’ technical content contained in the learning objectives and combines them into one perfect-bound book. Student Reference Guides supplement this course by providing a condensed, inexpensive reference tool that learners will find invaluable once they finish their training making it the perfect course takeaway.